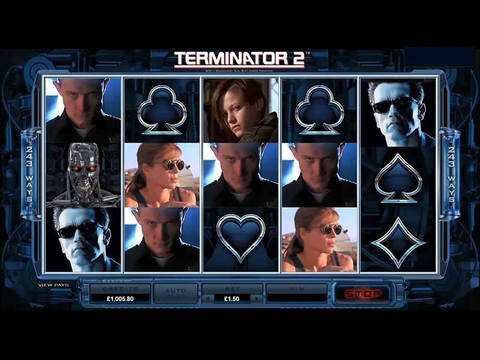 He said he'd be back and here he is in the all new Terminator 2 slot machine. This action movie slot has five reels and 243 ways to win on every spin. The adjustable bet runs from penny slot levels up to the betting range for more experienced players. You can try it for free right here on this page with no registration required. The game offers a free spin mode using Scatter symbols, in the form the T800 arriving through a time bubble. The jackpot is only available through this free spin mode. There are also Wilds which take the place of regular symbols on the reels but will not help make a Bonus or Scatter combination. The regular symbols of the game are Sarah and John Connor, T800 with and without skin, the T2 logo, and the T1000. There are also four playing card suits styled to look like they belong on biker jackets, a favourite fashion choice of the Terminator. The graphics are superb with winning combinations on the reels becoming animated, showing clips from the film and the music and sounds coming right from the source as well. We've come to expect no less from the leading Canadian online casino game developer Microgaming, especially with the success that the original Terminator slot has seen. While reviewing this free play slot machine, we can easily compare it to the Jurassic Park slot, also created by Microgaming. There are the same amount of reels to play off of in Jurassic Park, along with the same 243 ways to win feature. Both games also have an Action-packed theme, with edge-of-your-seat excitement, with both created with their counter-movies in mind. Both offer wilds, free spins, and scatters making them easy to be categorized together - its an easy decision to try one and then the other if you enjoy Action themed and movie slot machines. If we had to choose between the two, Jurassic Park edges out T2 slightly. Only because the graphics of the game are a little more animated and colourful. If you're not interested in those types of features, than T2 could easily be the better of the two games. Head over to this Canadian site, Jackpot City Casino where you can play Terminator 2 with a no deposit bonus of $10 or have your deposit matched 100% up to $500.